A comet is a small, icy, asteroid-like body, typically tens of kilometers across, that releases streams of dust and gas from its surface when its orbit takes it close enough to the Sun. This dust and gas, produced when the comet’s surface is heated by the Sun, forms an non-gravitationally-bound ‘atmosphere’ around the comet, called a ‘coma’. The gas and dust can also be blown away from the comet’s surface by the solar wind to produce spectacular luminous ‘tails’, which can reach millions of kilometers in length. The word comet derives from Greek word for hair, since they resembled stars with hair or long beards, due to their comae and tails, which can stretch for great distances across the night sky. Most comets have highly-elliptical orbits and are divided into two distinct categories: short-period comets and long-period comets. Short-period comets generally have orbital periods of less than 200 years, and are thought to mainly originate from the Kuiper Belt, the Scattered Disc and the Centaurs. 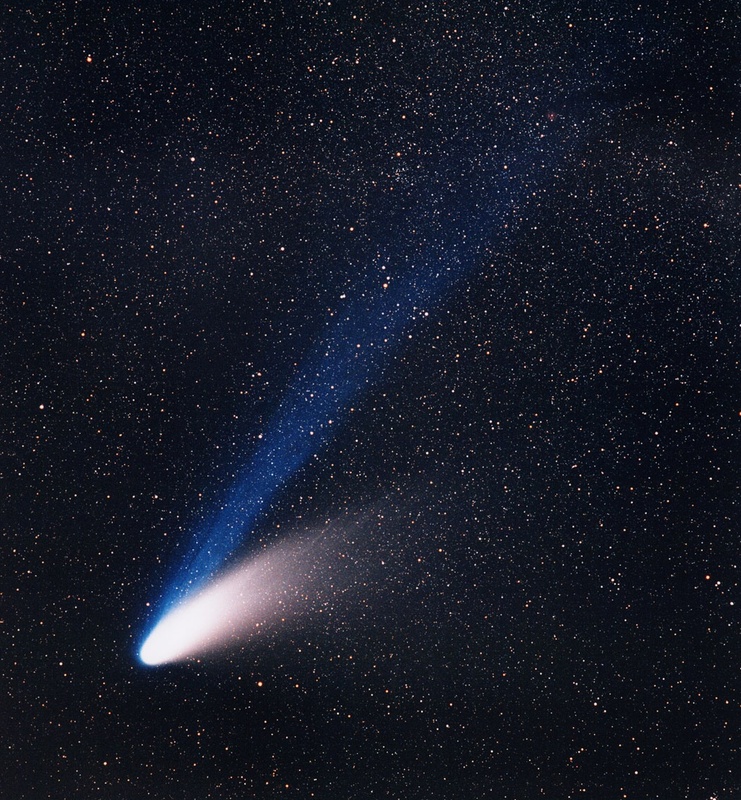 Long-period comets, however, are believed to originate mainly from the Oort Cloud. Comets often develop two distinct tails as they approach the Sun, one produced from gas and another from dust particles. A comet’s dust tail can develop a curved shape as the dust is left behind as the comet orbits the Sun; however, a comet’s gas, or ion tail, composed of charged, ionized gas molecules, will always point directly away from the Sun, as it more strongly influenced by the Solar Wind. A comet can sometimes appear from Earth to have what is known an ‘antitail’, pointing in the opposite direction to the comet’s dust tail. However, antitails are also composed of dust particles ejected from the comet, which can form a disc-like shape around the comet’s nucleus. The disc usually extends much further from the comet in one direction, to form the comet’s main dust tail, but viewed side-on from Earth, this disc can appear to form a short antitail on the opposite side of the comet. Comet Halley is perhaps the most famous of all comets, named after Edmond Halley, who first realised, in 1705, that the bright comets witnessed in 1531, 1607 and 1682, were in fact the same object, returning from the outer reaches of our solar system every 75 to 76 years. Halley’s comet, officially designated 1P/Halley, has been observed and recorded by astronomers since at least 240 BC, and also appears in the Bayeux Tapestry, the embroidered record of the Norman conquest of England, in 1066 AD. Comet Halley’s latest appearance was in 1986, and it is due to return again in 2061. Particles shed from Halley’s tail during previous visits are responsible for the Eta Aquariids and the Orionids meteor showers. Comet Shoemaker-Levy 9 was discovered in 1993 by amateur astronomers Carolyn and Eugene Shoemaker and David Levy. The comet had previously been captured by the gravitational field of Jupiter and had broken up into a string of fragments, which were on a collision course with the planet. In 1994, astronomers were able to watch as the fragments struck the upper atmosphere of Jupiter, leaving several large, brown, ‘bruise-like’ impact marks across the planet. The cometary fragments actually impacted Jupiter on the side facing away from the Earth, although close enough to the planet’s limb for fireballs to be seen above the edge of Jupiter’s disc. Luckily, NASA’s Galileo spacecraft, sent to study Jupiter’s moons, had an excellent direct view of the impacts, shortly before Jupiter’s rotation brought the impact sites into view for Earth-bound telescopes. The International Cometary Explorer (ICE) was the first ever spacecraft to be sent on a rendezvous mission with a comet. ICE was launched in 1978, as a joint project between NASA and the European Space Agency (ESA), and was originally designated the International Sun-Earth Explorer-3 (ISEE-3) satellite, but was re-tasked and sent to target Comet Giacobini-Zinner in 1985. Also in 1985, the approach of Comet Halley, inspired the launch of the Japanese Institute of Space and Astronautical Science (ISAS) Sakigake and Suisei probes, as well as the ESA’s Giotto mission – all three of which were sent to rendezvous with the comet. The ICE spacecraft was also deployed to pass through Comet Halley’s tail, and the joint-Soviet-and-French Vega 1 and Vega 2 probes, following their successful missions to Venus, added to what became unofficially known as the Halley ‘armada’, while the Pioneer 7 and Pioneer Venus Orbiter probes also watched Comet Halley from afar. Giotto also targeted Comet Grigg-Skjellerup after its rendezvous with Halley. In 1999, NASA’s Stardust mission returned a sample from the coma of Comet 81P / Wild 2, for analysis on Earth. The sample, captured in a sponge-like aerogel, was returned to Earth in 2006, and was found to contain glycine, an amino acid that is one of the fundamental building blocks of life. In July 2005, NASA’s Deep Impact probe conducted a flyby of comet Tempel 1, releasing an impactor probe designed to collide with the comet. The impactor returned images up to 3 seconds before the collision and send debris into space for analysis by the spacecraft. Observations showed that the comet was about 75 per cent empty space, and the outer layers of the comet were said to have a similar makeup to a ‘snow bank’. The Deep Impact spacecraft went on to conduct a further flyby of Comet Hartley 2, as well as observing two more comets, Comet Garradd (C/2009 P1) and Comet ISON (C/2012), from longer range. The ESA’s Rosetta mission was the first mission to successfully land a probe on the surface of a Comet. Rosetta’s Philae lander touched down on Comet Churyumov-Gerasimenko, also known as Comet 67P, on 12 November 2014; however, harpoons designed to anchor Philae to the comet’s surface failed to fire, resulting in the lander bouncing twice before coming to rest in the shadow of a nearby cliff or crater wall. This meant that Philae’s solar panels could not produce enough power to keep its batteries charged, and contact with the lander was soon lost. Philae sporadically re-initiated contact with the Rosetta spacecraft several months later between June and July 2015, as the comet neared the Sun, although most of the scientific objectives of the lander mission were not successfully completed. The Rosetta orbiter, however, discovered that the ratio of deuterium to hydrogen in the water from the comet is three times that found in water here on Earth, making it unlikely that Earth’s water originated from a bombardment of comets similar to 67P.